Ein neues Star Trek Spiel wirft seine Schatten voraus. basierend auf Mage Knight - Das Brettspiel von Vlaada Chvatill und für Star Trek bearbeitet von Andrew Parks. Seines Zeichens Co-Designer von STAW und DDAW! Sehr spannend! Auch wenn es das Ende von Fleet Captains bedeuten dürfte. Bleibt zu hoffen, dass das Spiel im Prime Universe angesiedelt ist und auch auf deutsch bei Asmodee erscheint, da es angeblich auch eine neue deutsche Version von Mage Knight geben soll, habe ich da zumindest geringe Hoffnung! 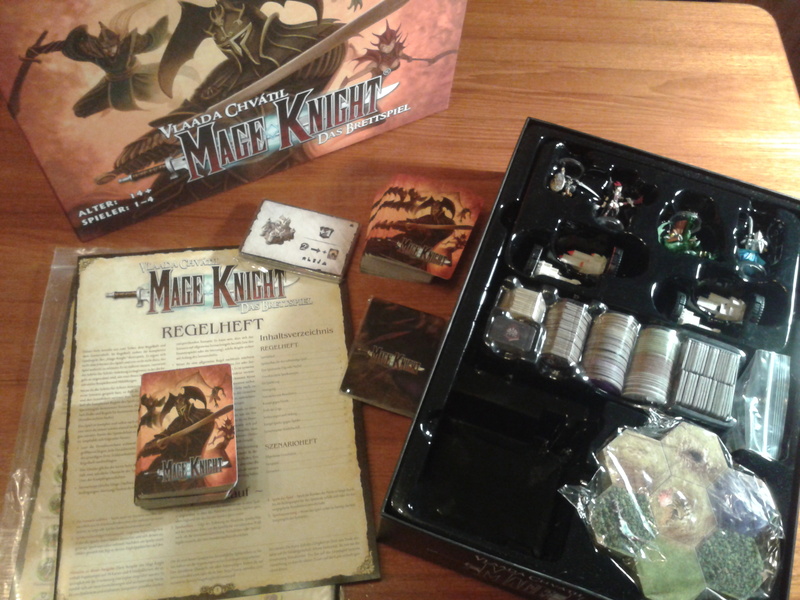 Und was ist Mage Knight? Ein sehr cooles Fantasy-Brettspiel. Auch von WizKids. Musst du mal googlen. Ui - schaut gut aus - auch wenn es leider leider das Ende von Fleet Captains bedeuten wird. Meine Hoffnung ist ja das zumindestens das Grundspiel nächstes Jahr im Rahmen des XIII Kinofilms nach Deutschland kommen wird. 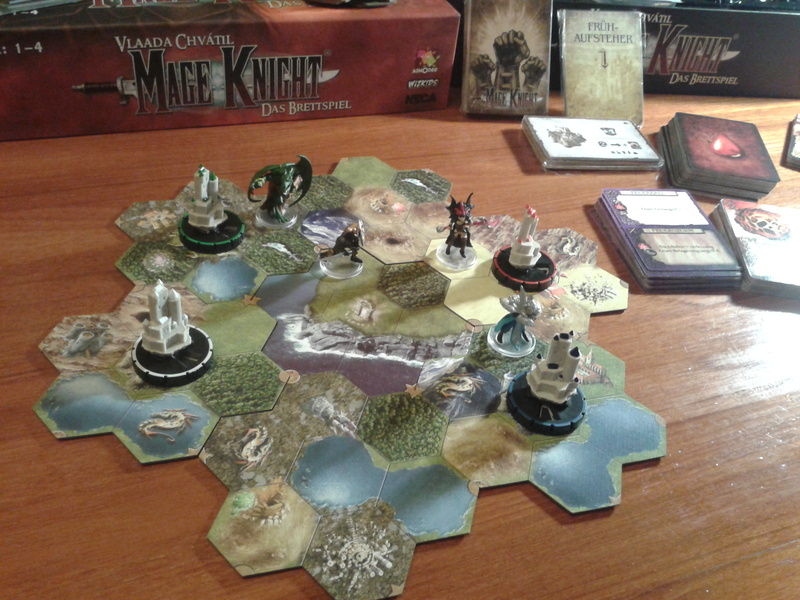 Mage Knight fand ich irgendwie immer sehr drüsch .... die sollen sich lieber darauf konzentrieren Attack Wing ordentlich zu supporten! Ah. Danke. Sowas dachte ich mir, kannte das Wort aber so garmicht. Attack Wing läuft meiner Ansicht nach soweit ganz gut - wenn sie etwas mehr "Energy" investieren sollten, dann erstmal vor allem auf die Op Events - ich sag nur mal --> fehlende Map Elements! Space, the Final Frontier... and you get to explore it in the upcoming Star Trek: Frontiers board game, coming soon from WizKids. The latest creation of celebrated veteran game designer Andrew Parks, Star Trek: Frontiers puts players in command of a starship and crew exploring a newly discovered region of space. Based upon the popular Mage Knight board game ruleset designed by Vlaada Chvátil, players in Frontiers will plot a course for adventure on one of several ships from the Star Trek universe, including the U.S.S. Enterprise NCC-1701-D, U.S.S. Defiant, IKS Negh’Var, or the IKS Cha’Joh, each with a uniquely sculpted and painted model to field. Star Trek: Frontiers challenges players to take command of a crew and deal with alien encounters (and threats) in far-off worlds. Each play-through of Frontiers guarantees the gamer a different adventure. The "Venture Tile" system map, customized deck building, Clix Dial™ System and a vast array of scenarios to choose from are all part of the Star Trek: Frontiers experience. With random enemy encounters and power-up rewards unique to each player’s ship, new challenges will arise on every adventure of Epic Exploration and Conquest. With each game offering a different set of encounters, players will keep coming back for more adventures, both in deep space and planet-side. At the start of each game, aspiring Captains choose a ship, and draw up a 16-card deck that includes a card for the ship's captain and a set of Skill Tokens. Reach higher levels from exploring, away missions, and defeating aggressive foes - higher levels equal more new Skill Tokens. Each encounter has the possibility of expanding your abilities as you can recruit new crew members, learn new tactics, and discover alien technologies. You also have to manage your resources and maintain your ship’s condition by performing repairs to keep power running to all your systems. Each of the four captains brings varied expertise and a unique personality to their ship. Jean-Luc Picard, the captain of the U.S.S. Enterprise-D, is an accomplished diplomat and explorer. His skills help peacefully resolve encounters and inspires his crew. Benjamin Sisko, captain of the U.S.S. Defiant, is a no-nonsense, battle-hardened commander who isn’t afraid to get his hands dirty. His quick thinking and resolve help him to get the most performance out of his "tough little ship." General Martok, in command of the IKS Negh’Var, is a seasoned Klingon warrior, honored leader, and an inspiration to all of his kind. Through his iron will and the support of his powerful ship, he will see his crew through many glorious battles. Lursa and B’Etor, the Sisters of Duras and commanders of the Klingon Bird of Prey, are cunning masters of subterfuge and manipulation. Their resourcefulness makes them a far greater threat than their small D12-scout craft would suggest. In Star Trek: Frontiers, players will encounter Romulan Warbirds, Dominion starbases, and the dangers of alien worlds, each requiring different skills and cards from your hand to solve, defend against, or defeat. The greatest threat, however, is the seemingly unstoppable Borg! They have infiltrated the deepest portions of this region of space and aim to expand at a near-relentless pace. There are four painted Borg Cube miniatures on HeroClix Combat Dial System bases that you can encounter. In conjunction with whatever scenario you are playing, the dial determines the level of difficulty of each Borg Cube and the hoard of assimilated units you must overcome. By defeating a Borg Cube (no easy feat), players gain salvage rights to the wreckage and can recruit special “former drone” crew like Seven of Nine and Hugh! The pre-made scenarios included in the rulebook let you customize the difficulty and length of gameplay. There are also multiple scenarios for competitive head-to-head, cooperative, and even solo play. Every time you play Star Trek: Frontiers it is like exploring uncharted space. Each game is different and every turn is a new puzzle to be solved by your wits and the cards in your hand. This game will stick in your head like a nanite in Data’s positronic matrix, with all the possibilities stimulating the real final frontier: your imagination! Ich bin auf die Karten und ihre Bebilderung gespannt. Die Schiffchen finde ich jetzt ehrlich gesagt eher mau. Unschlüssig bin ich noch, hinsichtlich der Entscheidung, Martok auf die Negh'Var zu packen, statt auch auf einen Bird of Prey. Wobei man dann halt zwei BoPs gehabt hätte und man so etwas mehr für's Auge bekommt. Ich schaue mal, ob ich nicht eine Mage Knight Rezension geschrieben bekomme, damit die Interessenten für Frontier wissen, wo das Spiel und das Spielprinzip herkommen. Ich habe mir vor ein paar Tagen die Videorezension zu Mage Knight angesehen. Ist im Grunde ebenso trocken, wie die ganzen Living Card Games von FFG. Karten drehen, aktivieren, Karten deaktiveren, Steinchen irgendwo drauflegen, Steinchen irgendwo wegnehmen, vielleicht nochmal würfeln und / oder den Gegner bedrohlich ansehen, während man die Karten auf seiner Hand mischt und schon hat man eine gigantische Armee auf einen Planenten gehetzt. Okay, nicht ganz so krass, aber im Grunde war es das schon. Ich bin dafür zu sehr Augenmensch. Entweder habe ich Massen an Minis auf dem Tisch, um das darzustellen, oder ich spiele ein Pen&Paper mit einer Gruppe, die ein Kommandounternehmen durchführen muss. Also für mich muss keine Rezi her, ich bin da ein totaler Kulturbanause. Klar, da sind wenig Minis drin, aber das Spiel selber macht auf mich einen durchaus brauchbaren Eindruck. Alleine die Erforschungsmechanik hat schon was trekkiges. Videorezis trügen auch. Ich habe eine von Fleet Captains gesehen und bin bald weggepennt. Aber das Spiel ist Star Trek pur! Gelesen und für gut befunden. Der Beitrag ist in gewohnt hervorragender Qualität und auch das vorgetelle Spiel gefällt! Interessantes Spiel, aber nicht ganz meine Welt wegen der üppigen Ausstattung und Spieldauer. Danke für die freundlichen Worte, Jungs.